Historians have charted the growing power of medical practitioners as professionals – either as doctors or nurses, but they are also aware that this was not always a one-sided process: patients often had ‘agency’; for example, in asserting their rights to medical care. But what about their families? 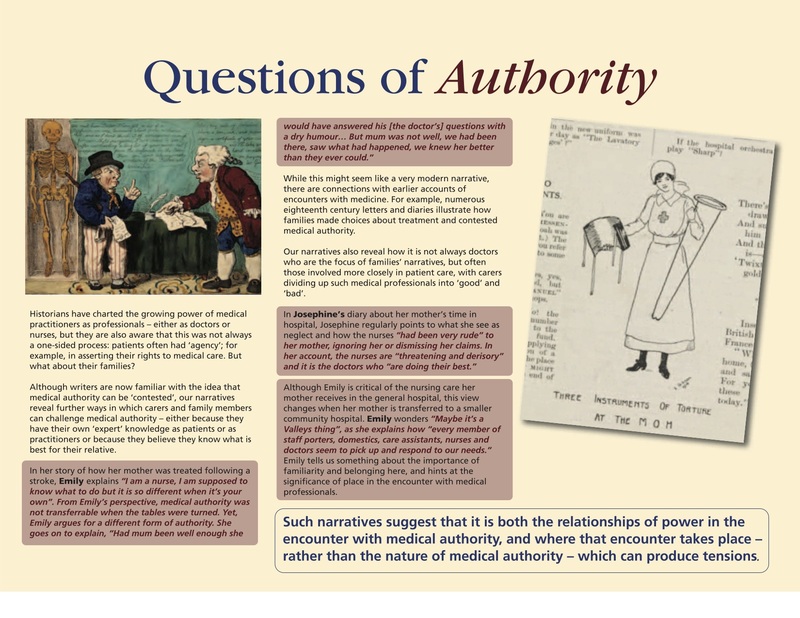 Although writers are now familiar with the idea that medical authority can be ‘contested’, our narratives reveal further ways in which carers and family members can challenge medical authority – either because they have their own ‘expert’ knowledge as patients or as practitioners or because they believe they know what is best for their relative. While this might seem like a very modern narrative, there are connections with earlier accounts of encounters with medicine. For example, numerous eighteenth century letters and diaries illustrate how families made choices about treatment and contested medical authority. Our narratives also reveal how it is not always doctors who are the focus of families’ narratives, but often those involved more closely in patient care, with carers dividing up such medical professionals into ‘good’ and ‘bad’. Although Emily is critical of the nursing care her mother receives in the general hospital, this view changes when her mother is transferred to a smaller community hospital. Emily wonders “Maybe it’s a Valleys thing”, as she explains how “every member of staff porters, domestics, care assistants, nurses and doctors seem to pick up and respond to our needs.” Emily tells us something about the importance of familiarity and belonging here, and hints at the significance of place in the encounter with medical professionals. Such narratives suggest that it is both the relationships of power in the encounter with medical authority, and where that encounter takes place – rather than the nature of medical authority – which can produce tensions.